When my daughter was two, I noticed that her left clavicle looked funny. I took her to the pediatrician and they said she was fine. A few days later, still seeing a lump, we took her back and they said her right clavicle was broken and to try to keep her still. Well, if you have ever seen an active toddler-and she was- that was very difficult. On our follow-up we were told that her clavicle wasn’t healing properly and we were sent to see Dr. Zimbler. It turns out the left clavicle was indeed fine, and the lump was the normal protrusion of the clavicle. What was abnormal was the right clavicle, which didn’t protrude and was read initially as a “break”. When Dr. Zimbler met us, he took one look at the x-ray and told us the clavicle wasn’t broken, but was a birth defect called pseudoarthrosis. This condition can be a symptom of other conditions, we were told. The names of the other conditions were long, and technical, and overwhelming. We were then sent to Dr. Feingold. At our initial visit, I was reminded that I had called the Pregnancy Hotline to inquire about the effects of asbestos after I had been exposed. It turns out that Samantha’s case was on file before she was born. While the Hotline didn’t know of any known birth defects, I then remembered that they had followed up with me after her birth, but the birth defects hadn’t been discovered. I had forgotten about the whole incident. Dr. Feingold followed Samantha for years, carefully monitoring her progress and as she reached each milestone, some of the other conditions were ruled out. At the National Birth Defects Center,(as it was known then), we had instant support and a network of the best doctors in the world. Her appointments were coordinated for us, and we could see multiple specialists in one visit, under one roof on the same day. As a working mother, this was a tremendous help. In between our regular appointments, the staff and doctors always fit us in when new developments occurred. We never felt alone. Samantha dislocated several joints over the years and had a variety of other things come up, unrelated to the pseudoarthrosis. On one routine visit, Dr. Feingold and his team listed to new symptoms she was experiencing and correctly diagnosed hypothyroidism at age 9. She was able to start treatment immediately. I have always felt that I was listened to, and that my child was receiving the best possible care. I was relieved to have a central location which coordinated her records and kept all the doctors involved in the different areas of her care informed. At one point, she was seeing eight specialists, but every single one had up to date information from all of the others. I couldn’t have done that on my own. We were never rushed through an appointment, and looked forward to the magic tricks Dr. Feingold would do. The tricks were always different, (EVERY time!) and always amazing. I never needed to worry that Samantha would develop a fear of doctors or hospitals. While we were there, we felt like family. Our family was invited to attend Yaz Day at Fenway Park, which was an unforgettable experience. Sam had the chance to run the bases, bat and catch balls off the Green Monster. Her older sister was able to participate, and was actually jealous she didn’t have a birth defect too. When we were there, Sam saw many children there with great physical and intellectual needs. She began to realize that her “problems” weren’t as severe as some others, and she could help the other children to have fun. As the years went on, Samantha “graduated” from The Feingold Center for Children. Our family began volunteering at events such as the Family Fun Day and the annual Holiday party. She was able to put her own issues into perspective and reach out to help others. Plus, we all missed the magic tricks. Since she has been released, we have still called the Center for help in choosing doctors. 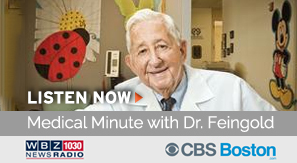 One time, Dr. Feingold stepped in to mediate between two specialists with opposite opinions. I know I will always have this resource to turn to, and I will get whatever help we need. The Center’s current location in Children’s Hospital in Waltham opened up a whole network of coordinated care. I know both Samantha and I will be treated with dignity and respect. Having a team of coordinated doctors on your side is invaluable. When I learned that my child had problems, I was sick with worry. It is an indescribable feeling of helplessness and powerlessness, fear and anxiety. I don’t know if those feeling ever went away completely. I will always worry. But I now know I don’t have to go it alone. We have the team of professionals at the Feingold Center for Children to thank for that.